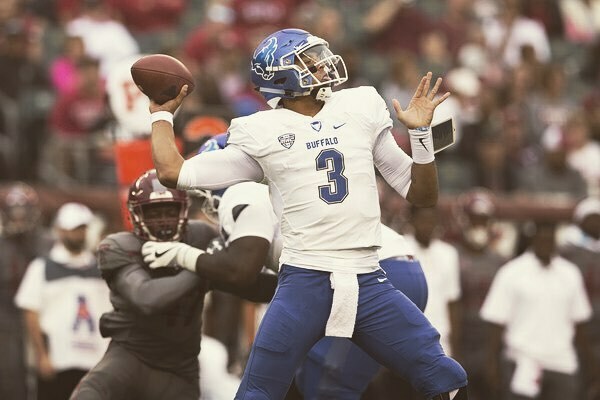 In a draft that’s headlined by a strong defensive class and a 5’10” quarterback prospect, there is one quarterback prospect that scouts could be salivating for on day three of the NFL draft. That prospect is Buffalo’s, Tyree Jackson. The 6’7″ QB prospect is what many in the scouting department consider the prototypical QB. Tall, big, strong-armed, and athletic -a trait that has helped QBs more in this new style of NFL football than ever. Jackson has the ability to make every throw and has an absolute cannon that has brought analysis to question who would win in a throw off between himself, the Kansas City Chiefs’ QB Patrick Mahomes, or the Buffalo Bills’ QB Josh Allen. With all this talent it makes you wonder why this kid isn’t a first-round prospect with more teams looking into him rather than a day three prospect that could end up playing second, or even third, fiddle to an aging QB. Jackson’s accuracy was one of the key red flags that stood out in watching him play. Although Jackson has an extremely strong arm, he is unable to use it properly as he fails to set his feet in certain cases and cannot deliver the ball in areas where his receivers can make a play after the catch. While drops plagued the Buffalo football team, Jackson failed to put the ball in the receivers catch radius on multiple occasions, but when Jackson was able to set his feet and make the right throw it was a dime. Jackson is praised by many for his incredible arm talent, and yes, I am one of the many that praise him on this, however, there are moments in which it seems Jackson does not know when to use this talent. On many occasions, Jackson either overthrew his receiver or under-threw his receiver. It was apparent that Jackson trusted his arm too much on some plays and not enough on others. Mobility was one of Jackson’s best traits. He moves around the pocket with ease, is able to produce yards with his legs, and is able to make difficult throws while rolling out. The drawback on this mobility is that more often than not Jackson will trust his arm too much and force a pass downfield which will either result in an overthrown ball or a turnover. Jackson showed that he had no idea what to do with the ball at times in games. From overthrowing his receiver to staring down his first option, to just straight up poor ball placement Jackson has red flags all over his decision making. While it is a red flag, Jackson does have flashes and when he combines it with proper footwork and proper arm strength he shows signs of being a future NFL starting QB. While Jackson has immense arm talent and prototypical size it’s apparent that he will need a few years to even scratch the surface of his talent. Jackson has the chance to be a back up to a vet QB while learning how to be an NFL caliber QB in the ideal system.